UK, 1953, 96 minutes. Black and white. Dirk Bogarde, Ian Hunter, Dinah Sheridan, Bryan Forbes, Walter Fitzgerald, Bill Kerr, William Sylvester, Richard Wattis. Appointment in London is the archetypal British film, focusing on the air force and the night bombing raids over Europe, especially bombing in Germany. 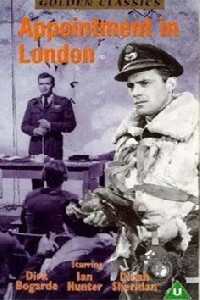 While made some years after the end of the war, it is one of many films, often with many of the same cast, which relived the battles of the 1940s. The film is crisply written, well acted, indicates very much the atmosphere of the British during World War Two and their attitude towards the defeat of Germany. With the characters, their behaviour, humorous and serious, it is a quintessentially British film. Dirk Bogarde was well into his career by this stage and was about to make Doctor in the House. With his long career, especially in more serious films from the 1960s, he was one of the principal British stars of the period. Dinah Sheridan was about to make Genevieve and had made Where No Vultures Fly. Bryan Forbes continued to act but moved into writing and directing. Ian Hunter had been a veteran Hollywood star of the 1930s and 40s. Audiences who know Bill Kerr from his later appearances in Australian films would find it difficult to recognise him, looking so young, as an Australian who joins the air force. William Sylvester, an American actor (who appeared in 2001: A Space Odyssey) represents the US. The film offers some characterisations and personal dramas, but focuses, sometimes in an almost documentary style, on the air force and it activities. The film was directed by Philip Leacock who was to direct The Kidnappers and The Spanish Gardener and other British films before moving to the United States and having thirty-year career, principally in television films and television series. 1. The quintessentially British atmosphere of the film, characters, situations, heroics? The underplaying of crises? 2. The title, the final honours from the king? The sense of achievement? 3. The perspective of the 1950s on World War Two? The range of films, black and white photography, the musical score, the cast, the international perspective, the heroics? 4. The flyers and their experience during the war? Germany and its development of the Luftwaffe? The blitz? The scenes with the Germans, the war rooms and the maps and targets? The planning of strategies? The comparison of the German strategies with those of the British? 5. The documentary style of the film, the details of the war room, the officers, the men, their technical expertise, the pilots, the bombers, the engineers? The maintenance staff? The staff room? The charts, the blackboard with information, the maps? The times, returning, those not returning? 6. The male atmosphere of the war? The importance of the men focusing on their missions, the place of their wives, the widows, women on staff? 7. Dirk Bogarde as Tim, his number of missions, his being driven in his attitude towards the war, serious, interactions with his men, their praise of him? The reprimand for Greeno and for Bill Brown? Turning it into praise? His interactions with Group Captain Logan? The authorities? The Doc? With the staff, his management, the injury to the flyer, his decision to go, his ninetieth mission? His achievement? His meeting with Eve, mistaking her at first, getting to know her better, falling in love? The rivalry with Mac Baker? The end, his transfer? 8. Logan, his role, keeping things objective, yet fatherly? Doc, his role with the men? Advice to Tim? 9. The US perspective, his courting of Eve? Her not responding? Brown, the Aussie flavour? Greeno, his phone calls to his wife, the cover, his being reprimanded by Tim? 10. Eve, the car breakdown, meeting the men, the drink, discovering she was an officer, with the briefing? Going out with Mac? Her fondness for Tim? The bond between them? 11. Mrs Greeno, her arrival, the group thinking she was Greeno’s mother, his phone calls to her, reassuring her? Her staying around, observing? Bringing the human touch into this story of the pilots, bombers and their wives? 12. The scenes of action, the flight, the bombings, the crises, the targets, the timing? 13. The overall impact of this kind of film in its time? In retrospect? Illuminating aspects of Britain in World War Two?